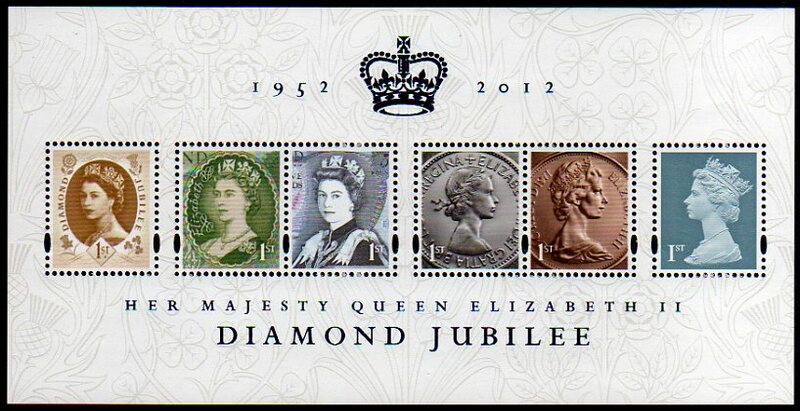 65th Anniversary of the Queen's Accession to the throne - a mixed blessing from Royal Mail. On 6 February 1952 King George VI died peacefully in his sleep at Sandringham House. The official announcement said the King retired in his usual health, but passed away in his sleep and was found dead in bed at 7.30 am by a servant. He was 56, and was known to have been suffering from a worsening lung condition. Princess Elizabeth, who was in Kenya at the time, became Queen Elizabeth II at the age of 25, and returned to the United Kingdom as soon as arrangements could be made. 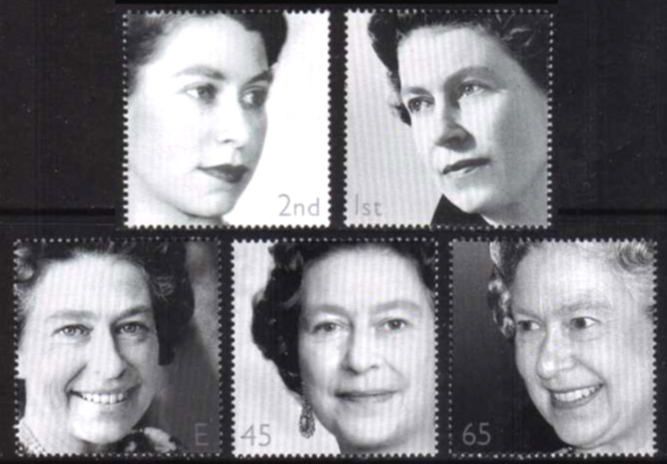 The Golden Jubilee in 2002 was marked by a set of stamps illustrated with five black and white studio portraits, in values from 2nd class to 65p. (SG 2253-7) This set was unusual as the paper was watermarked with multiple '50' - and those in the prestige book had the watermark upright, whilst the sheet stamps had sideways watermarks. Also included in the book was a pane of the first Wilding definitives revalued as 1st and 2nd class, one of the 2nd class being in the selvedge outside the normal pane of 8 and printed at an angle, dubbed the 'wonky wilding'. Also for 2002, the colour of the 1st class Machin definitive was changed to gold. 2012 marked the Diamond Jubilee of the Accession, and the London Olympic Games, and was a bumper year for Royal Mail stamps. The colour of the 1st class definitive was changed do 'Diamond Blue' in all self-adhesive formats, and was also included in a gummed miniature sheet accompanied by five other 1st class stamps. One was based on the 1s Wilding definitive, two included detail from coins, and two more were based on banknote portraits. The miniature sheet and some of the definitive stamps were issued on 6 February, others were supposed to be issued on 27 March, then delayed until 25 April, although some Post Offices managed to sell them as early as 8 March. 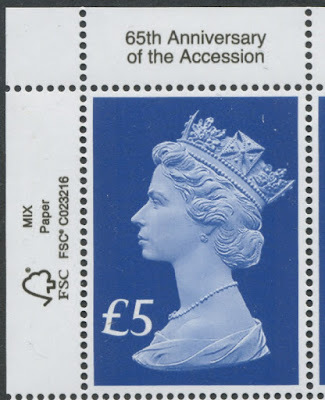 By now Post and Go stamps had been introduced and the commemoration included additional inscriptions on Machin Post and Go stamps sold at Stampex. And so to 2017 and the 65th Anniversary. How many stamps would be in the set, or miniature sheet that Royal Mail issues to mark this event? Well, we've already pictured a £5 Machin definitive - what may be just one of several, or may not - as shown on a cover-producer's website, but although we now have the stamps we cannot show them or provide any details until Royal Mail add it onto their own website or publish it in their Philatelic Bulletin. So there you have it - or not. We have the pictures all ready to add to this post, but it may not be before the end of January! show the real thing here, rather than design studio preliminaries. There IS only one stamp. 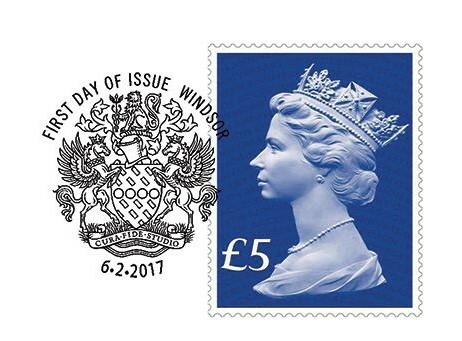 Although listed on the Royal Mail webshop in the 'latest special stamps' listing it is announced as a definitive, replacing the £5 blue issued in 2009. Nonetheless it has a commemorative iridescent layer, and a commemorative inscription in the top margin. I don't know how Royal Mail standing order customers are placed: ideally both those with High Value Definitives and Special Stamps on SO should receive it but I wouldn't want to bet either way! As you can see the design incorporates a 17 year code in the word ACCESSION in the iridescent 65TH ANNIVERSARY OF THE ACCE17ION. 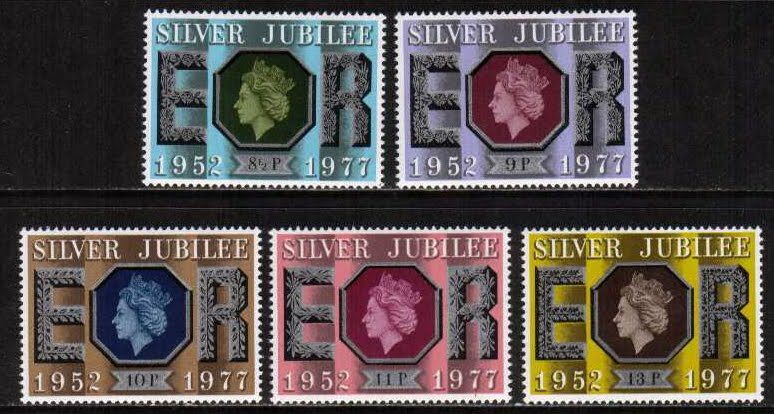 Although the existing high value stamps are not widely sold the existence of the year code suggests that Royal Mail have had a print run small enough to require more to be printed next year with an 18 code. Printed by (ISP) Walsall Security Print in gravure, the gummed sheet of 10 has the cylinder number adjacent to row 2 and the grid pattern adjacent to row 1, this enabling the purchase of a plate/cylinder block of 4 (or even a pair!). There appears to be no phosphor as The numbers are W1 (phosphor) / W1 (iridescent) / W1 sapphire blue. There is no printing date or sheet number. The stamp is now listed on our webshop with Norvic number 4500 (click here). I don't know where SG will include it in the Concise catalogue and we await the next Gibbons Stamp Monthly with interest. It is interesting that you say "stamps" and "pictures". Not that this suggests more than one value, but keeps everyone guessing. I like it!! Its on the RM website now! Thanks, must remember to refresh or clear cache. I looked at an earlier version of the same page. Now that the products associated with this issue have appeared on the Philatelic Bureau website I guess you'll be selling the "Gold proof coin cover", a snip at £1945. Or perhaps not! I think the Courvoisier trial singles set (see 30 January) would be a snip at the same price! I wonder if that price might be a bit on the high side. I'm assuming that you meant £1945 for one each of the three singles. Rounding a bit, that is about £625 for a single trial. Let's assume that the sheets are split and let's further take the risky assumption that there is only one sheet of each in private hands. That gives 100 copies of each trial. Would you really want to spend £625 for something of which 99 other copies exist? That sounds a bit on the high side to me. With 100 copies around they will be turning up in auctions for many years to come. I mis-read it as £19.45. You're right, of course, even allowing for some blocks being sold, there would stubs plenty even if only 1 sheet of each exists, which is far from certain. Are you sure that this £5 stamp was printed in litho? To my understanding Walsall Security Print does not have a litho printing press. Yes, you are correct, of course, thank you for pointing out my mistake- it's now corrected. Hi Ian, can you confirm the size of this stamp. Saw one alongside the large format definitives and it looked to be the same size as a vertical pair of large letter stamps. Cheers. More or less the same size as the originals (1977), so although the same width as the large stamps, not 2x the height. Details now added above. Now I am not in a good mood. I decided to forfeit 3 hours pay and go to the post office myself to pick up this stamp. In fact I visited two, and neither knew anything about it. One rang up and was told that not all post offices would be receiving it and that I should order it online. I object to this on two counts: firstly, nowhere that I have seen was this made clear and secondly I am not ordering ANYTHING online from RM given the terrible state of their systems in recent months. I also do not believe that Gibbons should be listing it, along with quite a few other items like stamp books from recent months. If RM were operating from an African or Arabian country Gibbons would have no hesitation in delisting it. To close, I believe that this is where RM and I part ways. I have been lukewarm on Machins for the last year and this just kills it dead. It's certainly not you! E-mail philatelic.enquiries@royalmail.com, attach a scan/photo of what you received and a copy of the whole sheet picture here. Quote your account and despatch/order number and tell them you want a whole complete sheet. Ask for a returns number, and a prepaid envelope.